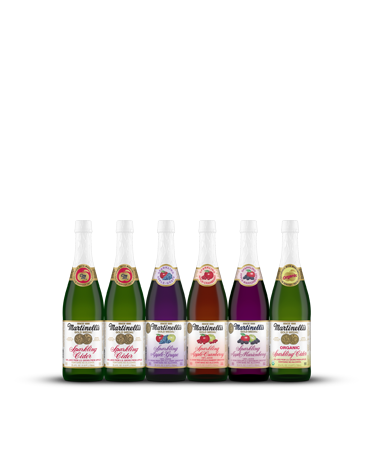 Martinelli’s Gold Medal 100% sparkling juices are all 100% juice from U.S. grown fresh apples, lightly carbonated with a crisp refreshing flavor. Comes with 2 bottles of 25.4-oz. Sparkling Cider, 1 bottle of 25.4-oz. Sparkling Apple-Grape, 1 bottle of 25.4-oz. Sparkling Apple-Cranberry, 1 bottle of 25.4-oz. Sparkling Apple-Marionberry and 1 bottle of 25.4-oz. Sparkling Organic Cider.